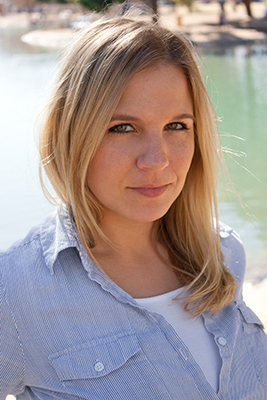 ERIN JADE LANGE is the award-winning author of contemporary young adult novels, Butter, Dead Ends, and Rebel Bully Geek Pariah. She is the winner of the Friedolin Youth Book Prize in Germany and the Sakura Medal in Japan. She has also been nominated for the Waterstones Children’s Book Prize (twice), the German Children’s Literature Award and multiple state book awards. Her debut novel was a 2013 Teens’ Top Ten Pick, and her books have appeared on several state reading lists. As a former journalist, Erin is inspired by current events and real-world issues and uses her writing to explore how those issues impact teenagers. She is an only child, so she spent a lot of time entertaining herself as a kid. This required her to rely heavily on her own imagination, which is probably why she became a writer. Erin grew up in the cornfields of northern Illinois, along the Mississippi River in one of the few places it flows east to west. She now lives in the sunshine of Arizona and will forever be torn between her love of rivers and her love of the desert.